RAWIllumination.net: The EFF an Illuminati front? The Illuminati mythos trundles on; in the latest issue of The Week magazine, Katy Perry explains that she is not, in fact, a member of the Illuminati. The above graphic is taken from science fiction writer Bruce Sterling's Tumblr, which Bruce accompanies with the comment, "That's pretty cool, for a civil liberties org." John Merritt sent it to me, commenting, "The EFF is an Illuminati front??!!" 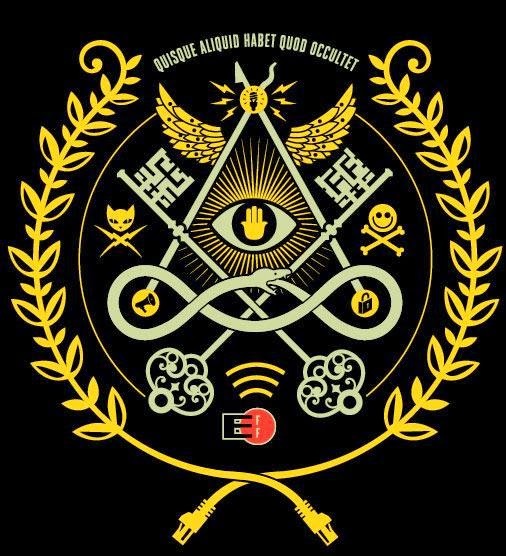 The Electronic Frontier Foundation, an Internet civil liberties group, says it's just a cool design for a limited edition T-shirt. Of course, that's what They want you to believe! I'd loved to have had that shirt but apparently it's sold out. John Perry Barlow, one of the EFFs founders also was a lyricist for the Grateful Dead, another reason for suspicion.